A rather interesting leak has occurred for Nvidia’s upcoming mid-range graphics card, the GeForce RTX 2060 which tells us both the performance of the card and also provides a key insight into Nvidia’s plans for their future GPUs. Let’s get to that first, shall we? You’ll notice that the card is indeed called RTX 2060, and not Nvidia GeForce GTX 2060. This is important because it likely means Nvidia isn’t cutting the RT and Tensor Cores completely for the RTX 2060 and possibly other mid-tier cards. Previously, the speculation was (and rumors might I add), that only the RTX 2070 and above would feature the Ray Tracing (and other RTX functionality), because the mid to lower end SKUs weren’t capable of running the graphics settings at acceptable levels. There is the possibility that Nvidia just wishes to keep the RTX branding uniform across the entire GeForce 20 series, but it’s also important to remember that “RTX” isn’t limited to Ray-Tracing. Despite many associating the two as the same thing, this isn’t true and encompasses a whole host of technologies – not least of all Nvidia’s DLSS (Deep Learning Super Sampling). If you think about that for a moment; it makes perfect sense. While a GeForce GTX 1060 put out a decent amount of performance, it was roughly half the speed as a GTX 1080. 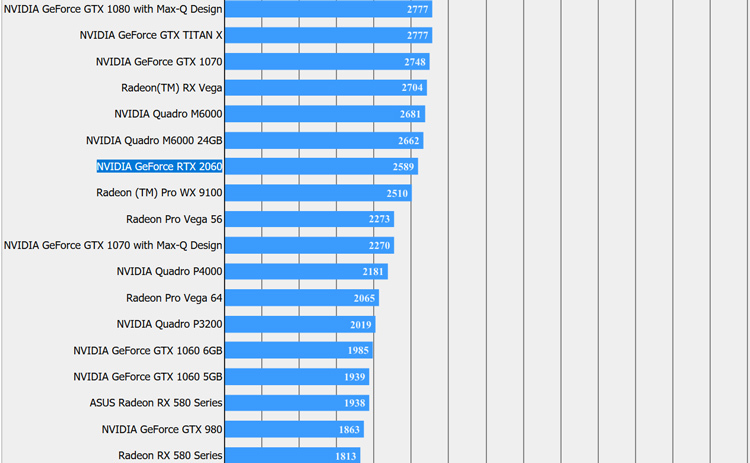 This meant that anything above 1440P for the vast majority of games was…. ambitious. But with DLSS technology refined for the RTX 2060, it’s possible we could see titles supporting this running at 1440P rather well. We recently did testing of DLSS in FF15’s benchmark with both an RTX 2070 and an RTX 2080 TI card, and it’s pretty clear that there’s a rather nice performance gain, with native 4K image quality closely matching the DLSS version. 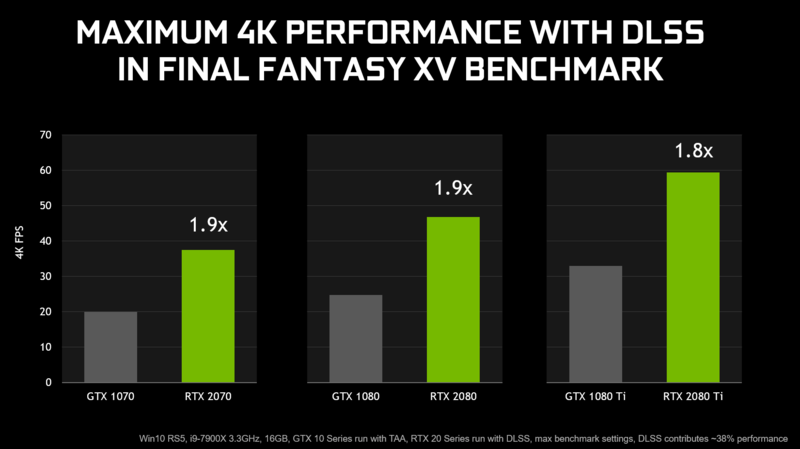 Let’s move on to performance then; and according to the Final Fantasy 15 Benchmark, Nvidia’s mid-range Turing entry seems to be roughly positioned in the same level as the GTX 1060, in other words, the RTX 2060 is about half the performance as the GeForce RTX 2080 card. Depending on the model of the RTX 2080, it’d typically score around 4900 points in FF15 benchmark at high quality in 4K, while this hits just a shade under 2600 points, 2589 to be precise. I’d love to see how well that performs with DLSS enabled when the card is finally released. Also, while on the subject of RTX technology, the folks over at Fudzilla claim to have sources who say Nvidia has plans to push the RT cores inside Turing to do more than just trace rays. Indeed, it appears they also can accelerate certain AI. This shouldn’t be super surprising to regular viewers / readers, as several months ago we covered news that the cores could supposedly help accelerate Ray Tracing audio, which essentially would improve positional audio in games, by being better able to predict how sound waves would react against different surfaces and angles. This will help immersion in games, but from the sounds (excuse the pun) of it, Nvidia have lots of plans to push RT cores to do so much more. Tagged with dlss, final fantasy 15, gtx 1060 vs rtx 2060, gtx 2060, ray tracing, rt, rtx 2060, rtx 2060 benchmark, turing.